Owning a Harley is about being free on the open road and here at Shaw's we are able to give a lot more to help you get there with a new Harley-Davidson Dyna® or Softail® model. Like up to £1000 extra when you trade-in your motorcycle. Or up to£1,250 to spend on customising your new ride with custom parts, or dressing to thrill with Harley riding gear from the vast range of genuine Harley-Davidson® Parts & Accessories or General Merchandise (PAM). In a nutshell, it’s your choice. With summer on the horizon, now is as good a time as any to take a step up with a new big V-twin engine Harley-Davidson, or simply take advantage of the chance to own the latest version of your present ride. 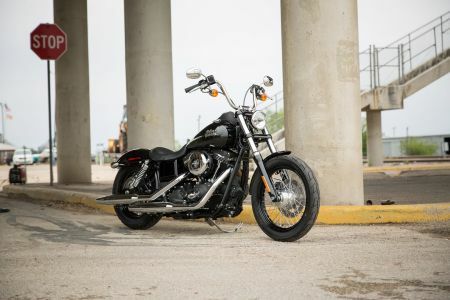 The Dyna and Softail models are original big-cubed rolling works of muscle loaded with engines and style-setting details to satisfy all riding styles. Take a look, as an example, at the Softail Slim® S or Breakout®, or the Dyna Street Bob® to see what could yours with a little help from us. Let’s not forget that with genuine Harley-Davidson®Parts & Accessories and General Merchandise up to the value of £1,250, the freedom of expression has no bounds. Live out your customisation dream with added machine parts or a selection of riding gear to stand out in the crowd as a free spirit. Need to know more? Then call in and talk with our knowledgeable sales team about Harley-Davidson®motorcycles and the chance to be even freer from routine. It’s a free world. Live it the Harley way. Customer may choose trade-in allowance or Parts & Accessories General Merchandise (PAM) voucher on the following terms when ordering a new Harley-Davidson®Dyna or Softail motorcycle between Friday 12th May and Sunday 2nd July 2017 and only during this period. Motorcycle must be registered by Sunday 30th July 2017. This promotion is available in UK & Ireland authorised Harley-Davidson dealerships and is subject to stock availability. Trade-in redemption value shall be as follows: Dyna family £750 trade-in allowance; Softail family £1,000 trade-in allowance. Trade-in allowance shall be added to the trade-in value offered by dealer and shall be specified on customer invoice of new bike purchased. PAM voucher value shall be as follows: Dyna family £1,000 Softail family £1,250. PAM voucher value includes VAT and will be shown on customer’s invoice as a discount. PAM voucher can be spent against genuine Harley-Davidson®Parts, Accessories and General Merchandise (excluding labour) at time of motorcycle order. No cash substitutions for either trade-in allowance or PAM voucher. Voucher may not be used in conjunction with any other Harley-Davidson offer.